It’s good to be back in Houston, Texas to meet old friends and make yet newer ones – not all of whom have a ‘crude’ side. On this visit, following on from last year and almost two years on from BP’s spill at the Macondo oil well in the Gulf of Mexico and the Deepwater Horizon explosion, the Oilholic finds a lot of positivity around. 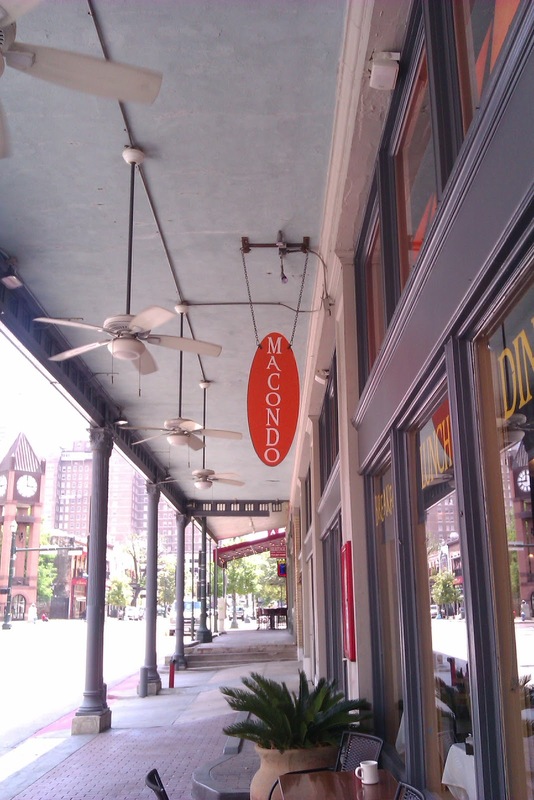 Over a chat at Macondo, the Latin Bistro off Travis Street (near intersection with Franklin), not the spill site, most commentators – be they from legal, advisory or financial circles – seem to suggest that the US economy has gradually turned a corner though doubts persist. While that is price positive for oil futures, some believe Chinese and Indian consumption may not be as trumped up as is being projected in the mass media. That’s not to say the consumption of both burgeoning economies won’t have an impact, only the impact would be felt less as both face economic headwinds. If combined with a dip in crude oil consumption in OECD jurisdictions, the scenario could be price negative but may well be countered by ongoing geopolitical factors. Brent is holding ground at US$120-plus while WTI is resisting US$100-plus and a comparable forward month futures price differential between both benchmarks is now over US$20 per barrel. Even the most die-hard market commentator is acknowledging (finally) that Brent is more reflective of global price pressures than WTI. From global crude pressures to local price pressures on the refined stuff, which is averaging in downtown Houston at US$3.90 a gallon, well below the San Francisco average of US$4.40 a gallon; still Houstonians remain an unhappy bunch when it comes to prices at the pump. A few good souls were both lucky and happy as a gas station in Texas made an error and marked the price at under US$2.00 a gallon leading to long queues before the owners could correct the error. One chap told a local radio station that he’d filled his car, his partner car, his mother’s car and his mother-in-law’s car before the error was corrected! Moving on from lucky sons and mother-in-laws to trends for independent upstarts, this state has always encouraged independents right from the heydays of wildcatters. In fact there is a lot of positivity around on that front too, especially if a new report from Moody’s is to be factored in. The ratings agency believes the risk profile has improved for many small exploration and production (E&P) companies focused on oil and natural gas liquids production (NGL), and companies with technological ability to exploit unconventional resource plays are expected to benefit from rapid production and reserve growth. “In addition, companies that have a high percentage of their production comprised of oil or natural gas liquids are expected to benefit from increased cash flow and greater liquidity. We believe that smaller, speculative-grade companies are disproportionately, and positively, affected by these developments," he adds. Technological advances have made it possible to economically access vast new resources that were previously locked in place. New horizontal drilling techniques and the development of multi-stage hydraulic fracturing have unlocked these reserves. Players who have been successful in applying these new drilling and completion techniques have lowered their finding and development costs, improved their risked return on investment, and enjoyed significant reserve and production growth. Future drilling results and production levels can now be predicted with greater certainty over large acreage positions, due to the improved performance of wells drilled using this new technology, says Moody's. Over the next few years, Moody’s expects many small E&P companies with a high proportion of oil and natural gas liquids in their production streams are expected to report improving operating cash flow levels, higher capital budgets, declining leverage metrics, and better liquidity. According to a spokesperson, with their existing ratings in brackets, these are: Alta Mesa Holdings (B2), Antero Resources LLC (B2), Baytex Energy (B1), Berry Petroleum (B1), Chaparral Energy (B3), Clayton Williams Energy (B3), Concho Resources (Ba3), Carrizo Oil & Gas (B2), Energy XXI Gulf Coast (B3), Harvest Operations (Ba2), Hilcorp Energy I (Ba3), Laredo Petroleum (B3) MEG Energy (B1), Oasis Petroleum (B3), PDC Energy (B2), RAAM Global Energy (Caa1), Rosetta Resources (B2), SandRidge Energy (B2), Sheridan Production Partners (B2), Stone Energy (B3), Swift Energy (B2), Unit Corporation (B1), W&T Offshore (B3). © Gaurav Sharma 2012. Macondo Latin Bistro, Houston, Texas, USA © Gaurav Sharma. Oh drat! Brits ask what the ‘Frack’! Houston, We have a natural gas price problem!